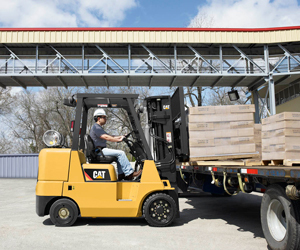 The GC35K-GC70K STR Series of lift trucks provides maximum performance in a variety of applications due to increased efficiency and operator-friendly controls. Extended service intervals, the advanced Engine Protection System and easy access to service components results in increased uptime for your material handling applications. Cat forklifts are offered for sale, lease, rent by Kelly Tractor Co.. Cat Lift Trucks offers a complete range of forklifts designed to handle your material handling needs with capacities ranging from 1 to 16.5 tons. We also offer CAT Forklift parts and service. Please contact us at 305-592-5379 for more information.